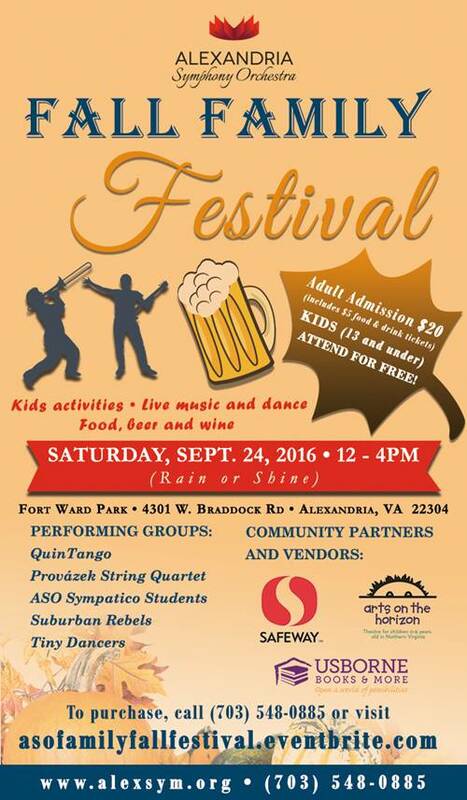 Saturday, September 24: Family Fall Festival sponsored by the Alexandria Symphony Orchestra at Fort Ward Park (4301 W. Braddock Road) from noon until 4 p.m. Featuring music and dance ensembles comprised of Alexandria area students; food trucks; activities for children and more. Adult admission (which includes $5 food and drink tickets) is $20; children 13 and under are free. All proceeds benefit the Alexandria Symphony Orchestra. Purchase tickets here. No rain date. Sunday, September 25: Town hall discussion with City Council Member Justin Wilson at Beatley Library (5005 Duke Street) from 2:30 to 4:00 p.m. The topic will be overcrowding at both the main campus of T.C. Williams and the Minnie Howard campus, and the recommendations made earlier this year by the T.C. Williams Instructional Leadership Team, T.C. PTSA, Hammond Middle School PTA and George Washington Middle School PTA to rebuild the Minnie Howard ninth grade center on its present Braddock Road site to accommodate more students at Minnie Howard, thus reducing the number of students at the King Street campus. All members of the community are invited to attend. Friday, October 7: Family Splash Night at Chinquapin Aquatics and Recreation Center (3210 King Street) from 6:00 to 9:00 p.m. The featured school is Charles Barrett Elementary but all families are welcome. Admission is $4 per person. These events are co-sponsored by the Alexandria Parks & Recreation Department and Advocates for Alexandria Aquatics. The next Family Splash Night will be on November 4, with MacArthur Elementary being the featured school then. Sunday, October 9: Dessert and Dialogue in the Fellowship Hall at Westminster Presbyterian Church (2701 Cameron Mills Road) from 7:00 to 9:00 p.m. The guest speaker is Dr. Francis Collins, Director of the National Institutes of Health, who will address the complexities and challenges of changes in healthcare. Free and open to the public. ASO Sympatico, the music-for-social-change program which was honored with a mayoral proclamation at an Alexandria City Council meeting in June, has a happy problem: Many bucket band participants but not enough drumsticks. If you have some that are gathering dust in a closet and would like to donate them to a worthy cause, please write to portcitynotebook@gmail.com. Also appreciated are monetary donations to support this program, which provides daily before- and after-school music instruction to 100 students in five ensembles at John Adams Elementary School. According to a recent survey of academic teachers at John Adams, students enrolled in Sympatico show increased focus, are more excited about coming to school and enjoy working in teams.